All our wheels are chrome plated to BS Service Condition 4 using 30 microns of Copper Nickel and Chrome. The old traditional way! The rim and centre are hand polished using felt bobs and mops, giving a mirror finish, even polishing the back of the rim. For the concourse competitor! Being a Press tool Maker by profession I've copied the original 1960s style Dunlop splined centre. Making it from Deep Drawing quality steel. It has the deep curly section, not like the imported heavy forged ones. 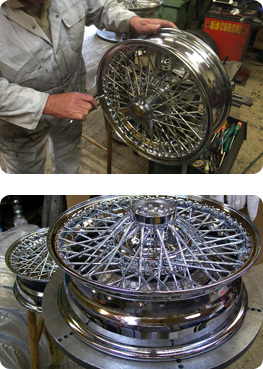 Please give us a call for other wheel requirements and also custom rechroming of all classic car parts. Our wheels are a British Product made by a British Craftsman! Please contact us on 01895 674852 to discuss your requirements, we are happy to help.